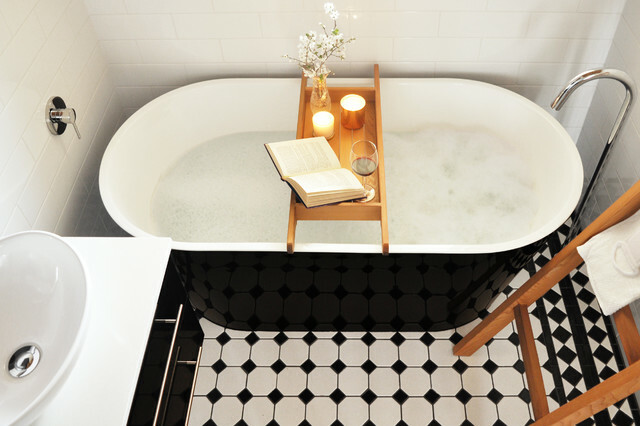 This monochrome bathroom is styled to look modern yet classic, the use of the black bathtub and vanity are a twist on the traditional white bathroom but maintaining a classic look. The addition of timber accessories add warmth and country charm to the room. Simple timber accessories such as a bath caddy or a towel ladder can make a huge impact whilst maintaining simplicity. Bath caddyWhile you’re soaking in the tub, or even taking a shower, a bath bridge or caddy is a handy way to keep all your toiletries in one spot (no more balancing bottles precariously around the edge), or to set the scene for relaxation. Light some aromatic candles, add plenty of bubble bath, then lie back and unwind.